Dr. Sanchez says that it can be avoided by ensuring a nutrient-rich diet and most importantly an adequate calcium intake. He also warns that a diet lacking in proper nutrition, such as severe weight-loss diets and eating disorders, could also be the fuel for osteoporosis. There are many ways of explaining the porosity of the bones, a simple one is that the trabeculae (walls) of your bones, that hold up the weight of your body, are deteriorating; the bones get weak and this creates a higher risk for bone fractures or broken bones. 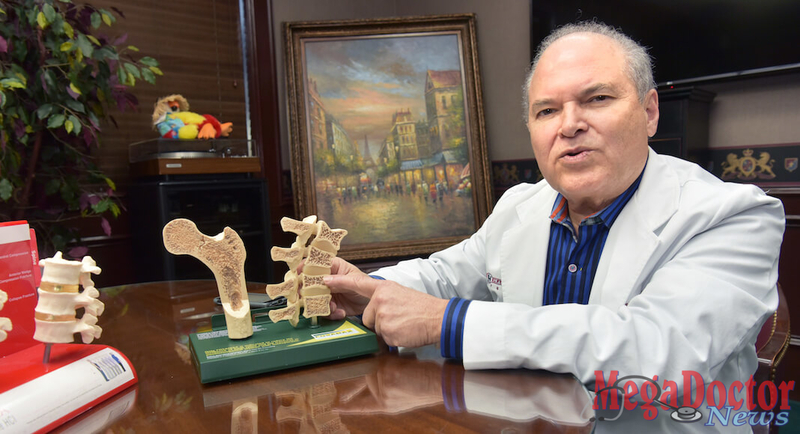 Dr. Sanchez stated that when the disease is in an advanced state, the bones lose strength. The vertebras of the spine, the lumbar and thoracic bones are more commonly affected. The characteristics of osteoporosis disease are low bone mass and loss of bone tissue that may lead to weak and fragile bones. Dr. Sanchez says that the largest group of people at risk of osteoporosis is women age 50 and over. Secondly, are those people that are thin and petite, like Asian, and Mexican-Indian. “Caucasians are also susceptible; because of hereditary risks. They don’t have a lot of bone mass,” he said. Dr. Manuel J. Sanchez, showing a bone model. He explained that other factors can help to avoid or delay the progression of the disease, like making sure you have an adequate level of vitamin D. Engaging in physical motion that is regular weight-bearing activity is important to maintain the bones density. It can be either low-impact or high-impact exercise. Also, it is important to avoid heavy drinking, and smoking, and a sedentary lifestyle. 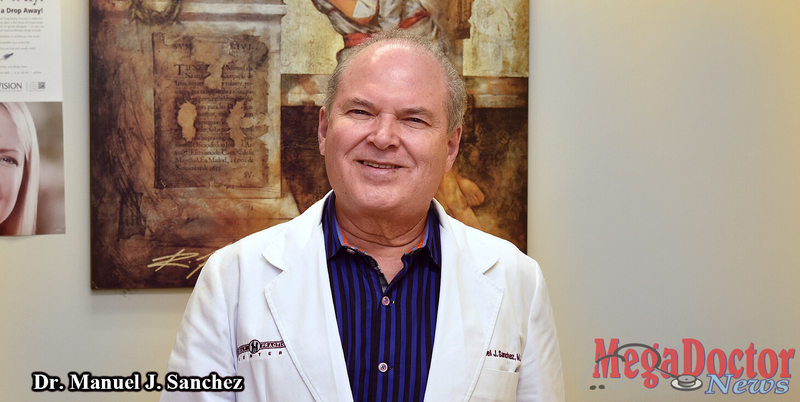 Dr. Sanchez is a seasoned physician who participates in continuing education and training; he is always learning about his field. 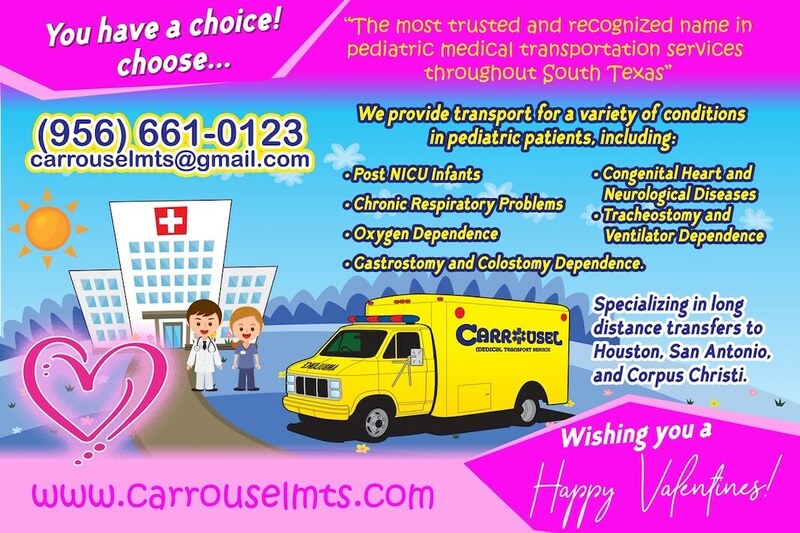 Being a family practitioner, he wants to be there for his patients, always ready. Dr. Sanchez also has a message for those that live sedentarily. “Yes,” he said, “People who don’t exercise, the couch potatoes, develop it a lot more.” This degenerative disease can even be a problem for vegetarians because he says if they don’t get enough calcium, they could also have a problem. You have learned a lot about osteoporosis, it’s widespread in women after menopause, that’s when they are more likely to develop osteoporosis. How do people find out if they suffer from osteoporosis? How do you treat people with osteoporosis? Dr. Sanchez: “We treat it with medication, and there are hormones for it as well, depending on how advanced it is. If you already have a fracture, the treatment is going to be different, but the basic treatment that we give for everybody includes calcium replacement therapy, and vitamin D, we need enough vitamin D.” He said that sometimes people take very little vitamin D and he recommends four or five thousand units of vitamin D every day or more, depending on the level of the vitamin in their body. Can you buy vitamin D over the counter? Dr. Sanchez: “Yes, it is readily available over-the-counter.” Aside from this, he said it is important to include healthy choices of foods that provide vitamin D in your diet. He advises to get enough calcium and vitamin D, and once again, he emphasized that it is important for people to exercise, to walk, run, or just jog. “Anything that is a weight-bearing exercise.” Dr. Sanchez also recommends checking your hormones, beginning in your late 30s, because osteoporosis takes a long time to develop. His message for men is to get tested, and if testosterone is high, then there is no problem. “But if it’s low, we start replacing it to make it normal,” he said. He said that, in general, most meat can cause inflammation. When you eat pork, beef, chicken, and especially barbecue, all of that produces inflammation because of the fat content. “Salmon does not, it decreases inflammation in your body. And we know that even heart attacks have to do with inflammation now. Inflammation causes a lot of the diseases that we have,” he said. Dr. Sanchez with the DEXA Scan, an instrument used to measure bone density. How do you diagnose osteoporosis? Dr. Sanchez: “We diagnose osteoporosis with an in-house machine called the DEXA Scan. It consists of two tiny rays that come out from the machine. It is very safe, it does not require any special walls or any special clothing or anything; it is not harmful. It’s a very small, tiny dose. It measures the density of the bone. It gives a report that tells us how much bone mass has been lost and what is left. The report gives a score, the T-score. 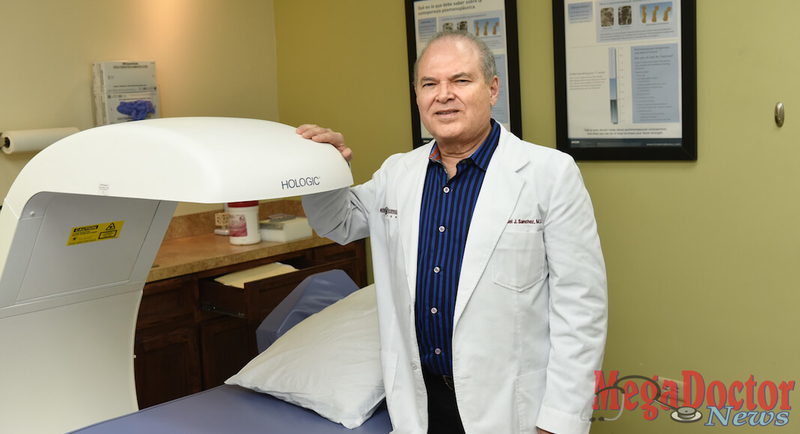 Dr. Sanchez says that his goal is to provide the best treatment possible to maintain a healthy level of vitamin D in the body. Maintaining an adequate level can help to prevent osteoporosis, and the risk of falls, and fractures of the bones, and the problems associated with that.